a small mass of tissue in the form of a swelling, knot, or protuberance, either normal or pathological. adj., adj no´dal. node of Aschoff and Tawara atrioventricular node. atrioventricular node (AV node) a collection of cardiac fibers at the base of the interatrial septum that transmits the cardiac impulse initiated by the sinoatrial node. Bouchard's n's cartilaginous and bony enlargements of the proximal interphalangeal joints of the fingers in degenerative joint disease; such nodes on the distal joints are called Heberden's nodes. Delphian node a lymph node encased in the fascia in the midline just above the thyroid isthmus, so called because it is exposed first at operation and, if diseased, is indicative of disease of the thyroid gland. Heberden's n's nodular protrusions on the phalanges at the distal interphalangeal joints of the fingers in osteoarthritis. Similar nodes on the proximal joints are called bouchard's nodes. 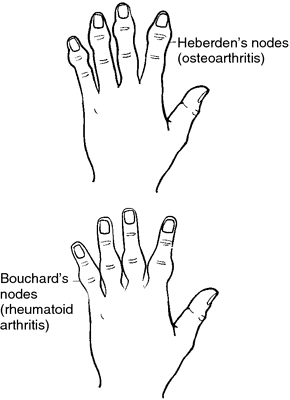 Comparison of Heberden's nodes (seen in patients with osteoarthritis) with Bouchard's nodes (seen in patients with rheumatoid arthritis). From Copstead and Banasik, 2000.
hemal n's nodes with a rich content of erythrocytes within sinuses, found near large blood vessels along the ventral side of the vertebrae and near the spleen and kidneys in various mammals, especially ruminants, having functions probably like those of the spleen; their presence in humans is doubtful. Keith's node (Keith-Flack node) sinoatrial node. lymph node see lymph node. Osler's n's small, raised, swollen, tender areas, bluish or sometimes pink or red, due to inflammation around the site of lodgement of small infected emboli in distal arterioles; they occur commonly in the pads of the fingers or toes, in the palms, or in the soles and are practically pathognomonic for subacute bacterial endocarditis. Parrot's n's bony nodes on the outer table of the skull of infants with congenital syphilis. n's of Ranvier constrictions of myelinated nerve fibers at regular intervals at which the myelin sheath is absent and the axon is enclosed only by Schwann cell processes. Schmorl's node an irregular or hemispherical bone defect in the upper or lower margin of the body of a vertebra into which the nucleus pulposus of the intervertebral disk herniates. 1. the first lymph node to receive drainage from a tumor; used to determine whether there is lymphatic metastasis in certain types of cancer. If this node is negative for malignancy, others “upstream” from it are usually also negative. signal node an enlarged supraclavicular lymph node; often the first sign of a malignant abdominal tumor. singer's n's vocal cord nodules. sinoatrial node a collection of atypical muscle fibers in the wall of the right atrium where the rhythm of cardiac contraction is usually established; therefore also referred to as the pacemaker of the heart. Called also SA node. syphilitic node a swelling on a bone due to syphilitic periostitis. node of Tawara atrioventricular node. teacher's n's vocal cord nodules. Troisier's node (Virchow's node) sentinel node.